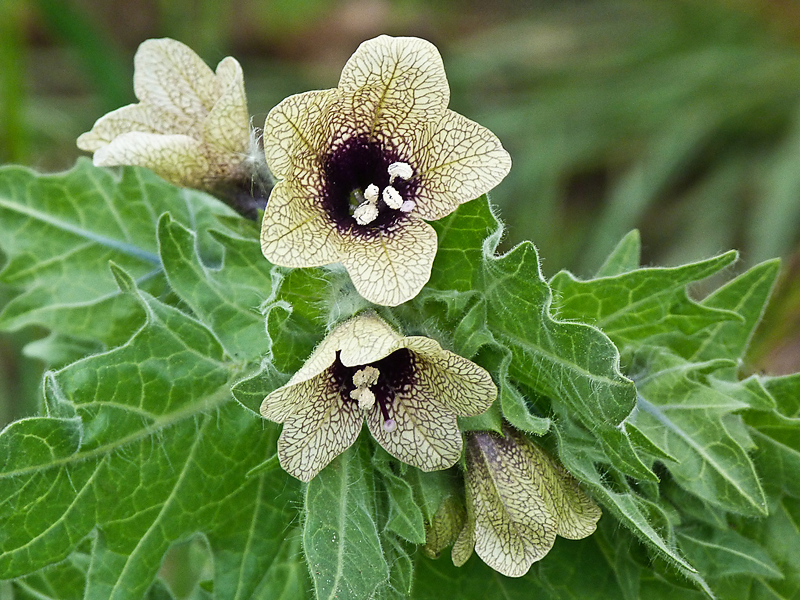 Black Henbane (Hyoscyamus niger) is covered with greasy hairs and has a thick, fleshy taproot. Stems are upright, tough – almost woody - and can be very thick. Plants can grow to 1m or taller and may be branched or unbranched. Leaves are alternate, large – up to 15 cm wide and 20 cm or more long – and have a heavy, foul scent. Leaf edges are shallowly lobed (variable) and veins are conspicuous. Flowers are pale yellow with deep purple veins and throats and are borne on spikes. Flowers are hermaphroditic – both male and female organs – and have a strong, unpleasant smell. The flower base forms a 2.5 cm urn-shaped fruit with a thickened lid that pops off at maturity and spills the numerous, tiny, black-brown seeds is primarily by seed production and sprouting from lateral roots to a lesser extent.